Take a look at the left side of that graph. 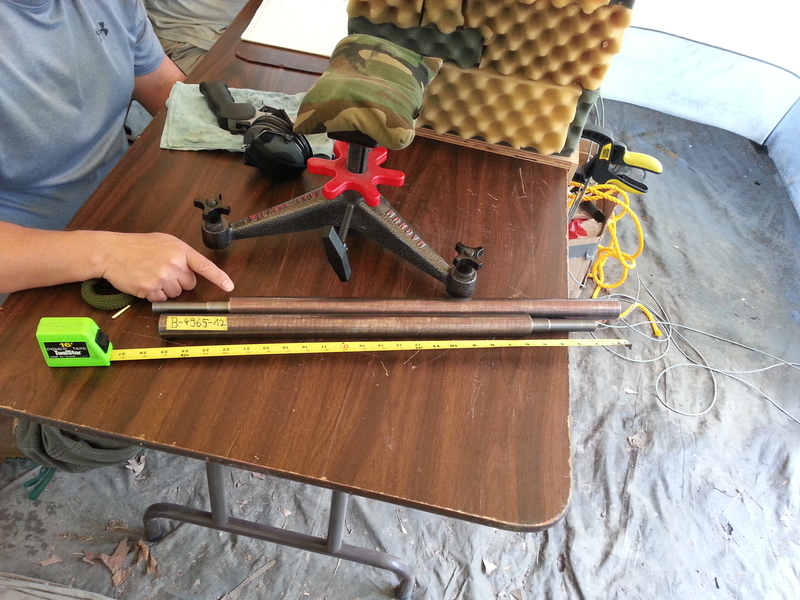 There’s some indication that the bullets are actually slowing down in the last couple of inches of an 18″ barrel. Whether or not this is just a glitch in our earlier test data, or an indication that friction is starting to win out over the remaining energy from the expanding gas of a fired cartridge is something I’ve always wondered about. Clearly, at some point a bullet will start to slow down, even stop; anyone who has ever fired a squib load and had to hammer the bullet out of a barrel knows that this can indeed happen. But at what point would this effect start to be clear? Good question. And not one we really wanted to spend the money on to find out. See, the barrel blanks we’ve used all along came in an 18″ length standard for pistol calibers/cartridges. Longer barrels were available from different sources, but there was a big jump up in price for those, and it just didn’t make much sense to get into that. 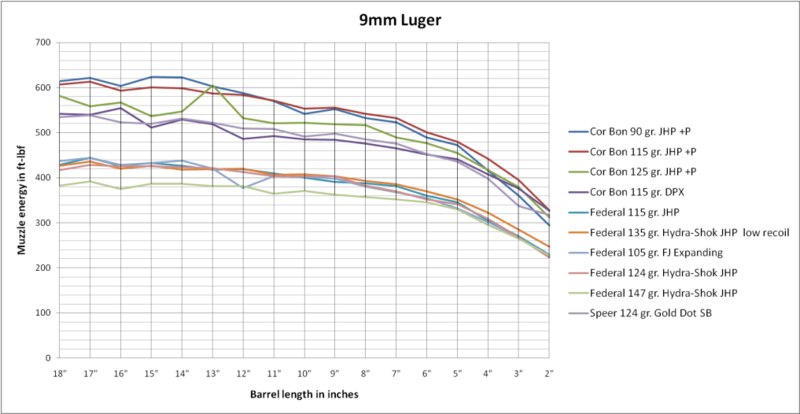 So, there ya go: in each and every case, there is a noticeable decrease in velocity in going from an 18″ barrel to either the 24″ or 26″ barrel. And keep in mind that the protocols for this test were 10 shots of each ammo at each barrel length over two chrono units, rather than just 3 shots as we had done for previous chop tests. Not too surprising, but nice to see actual data. We hope to have the full data sets, with charts & graphs, up on the website soonish (maybe next week?). Watch here and on our FaceBook page for a posting when it is available. Everything I shoot is not worth the effort to find a longer barrel than 16″. GREAT INFO, BBTI! I use your posted data a lot! various powders it occurred to me, that pistol powders are DESIGNED to be burned in shorter barrels. 2400, MP-300 and such, for .44mag, 45ACP, and 50AE in 18″ barrels. I’m seeing 1700-1950 fps for the first and last of those. Thumpers. primers looking ok.
That makes perfect sense, dancowan, and is basically turning those cartridges into rifle rounds. The one thing you’ll need to watch is not mixing that ammo into ammo you use for your handguns, where the performance will be much worse. Be safe, and be sure to share your results with other reloaders when you feel comfortable that you’ve worked up safe, effective loads! why is the polygonal rifling different? Firearms today typically use one of two different styles of rifling to impart spin to a bullet and thereby stabilize it for flight. Traditional rifling uses a number of lands & grooves (L&G) which are cut into the barrel, and is the style of rifling most people are familiar with. But a number of firearms manufacturers use polygonal rifling, most notably Glock, H & K, and Kahr.